Associates of Glens Falls Inc. combines years of experience with leading-edge products to provide exceptional service and value to our customers. Our product offering includes insurance products and risk management services for commercial property; automobile liability and physical damage; workers’ compensation; excess liability; marine; specialty coverages; surety; and employee benefits, including health, life, disability, payroll deduction and personal lines programs. Founded in 1967, Associates of Glens Falls is one of the largest, privately held, independent insurance agencies in Upstate New York. The experience and talent of our team has enabled us to work with clients throughout the country and we are well known for our work in an array of industries such as: Construction, Resorts, Recreation, Social Services, Not-For-Profits, Condominiums, Restaurants and Manufacturing. 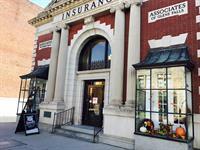 The agents at Associates of Glens Falls take the time to understand the specific needs of every customer and work with our insurance partners to take the guesswork out of buying insurance. We then develop insurance policies best suited to protect the individual or business. We serve clients throughout the country (from Maine to Hawaii), and are licensed in 46 states. Our ability to build and deliver risk management and insurance programs that are both customized yet scalable will be one of the key reasons you will want to choose Associates of Glens Falls.